Optic nerve sheath meningiomas (ONSM) are rare, and usually benign, tumors involving meninges surrounding the optic pathway. They have a higher incidence in middle-aged females. Diagnosis is heavily reliant on magnetic resonance imaging (MRI). ONSM can be subclassified as primary ONSM (pONSM) and secondary ONSM (sONSM). ONSM, in general, exhibit slowly progressive enlargement, which invariably leads to visual symptoms and/or vision loss. Although surgery may have a role in sONSM, it commonly leads to postoperative blindness with pONSM. 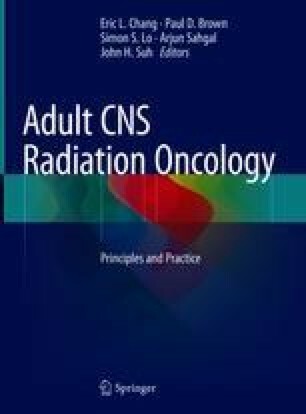 Radiotherapy (RT) remains the mainstay of treatment for this condition. Highly conformal RT techniques such as stereotactic fractionated RT (SFRT) have been shown to be effective in retaining functional vision, with low treatment-related morbidity. At fractionated doses of 50–54 Gy, almost all patients achieve local control, and 80% or more of patients report vision improvement or stabilization. In this chapter, we will review the clinical findings and the treatment recommendations for this condition. Phase II Trial of Observation for Low-Risk Meningiomas and of Radiotherapy for Intermediate- and High-Risk Meningiomas [RTOG 0539 Protocol Information]. Available from: https://www.rtog.org/ClinicalTrials/ProtocolTable/StudyDetails.aspx?study=0539.